OMG, I have the most amazing liquid sand textured nail polish set from Born Pretty Store. This set from their Tribal range and you get 4 x 6ml polishes. They are fantastic value, four textured polishes for just over £3 - bonkers! And the colours are wonderful. 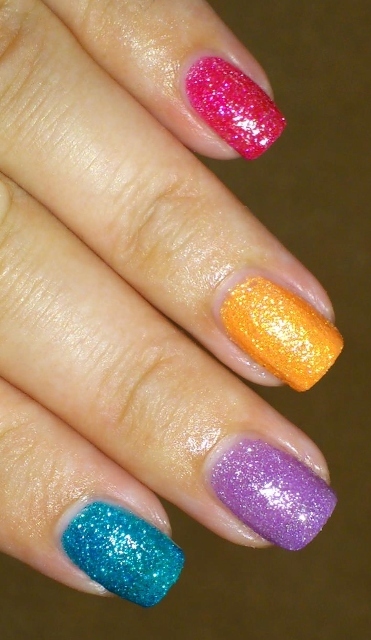 I have on two coats with top coat, I like the way the top coat brings out the glitter/sparkle in the polishes. Good quality polishes, they painted on a dream, I think they are really fantastic and I've already recommended them and one of my Facebook chums has bought 2 sets! This is set number 15, blue, lilac, gold & pinky red - all gorgeous! And you also get a tub of nail polish remover pads with each set! I highly recommend this set, the polishes are great and at a bargain price, go for it nail polish lovelies, you won't be disappointed, I can't rave about these enough! 4 x 6 ml bottles, 6 different sets and nail polish remover pads included. Fabulous! Highly recommended! Check out my vid below. The 4pcs/Set 6ml Tribal Special Texture Liquid-Sand Suede Glitter Nail Polishes Varnish is currently $4.99 / £3.18 / €3.71 and if you use my discount code HXBQ10 you get 10% off full priced items!! Check out the Born Pretty Store website for loads of cool nail art goodies. Thanks for sharing these; I was wondering how they were. I'm slightly obsessed with textured polishes... really considering picking these up and with free international shipping, why the heck not? ?